India in March : Travel budget & tourist seasons. Budget your trip depending on your departure time. Beyond the tourist season (low, medium or high season) of the destination country, prices of your flight, hotel or all-inclusive stays may also vary depending on the demand in your country (our rates are evaluated from western Europe). Thus, from western Europe, a stay will often be more expensive for a start during the school holidays. In March, weather conditions in India make it a good trip destination, however some areas should be avoided. Among our chosen destinations (see below), the average temperatures you'll face in March would be between 17.2°C and 27.4°C, with exceptional possible peaks as low as -5°C and high as 42°C as observed in previous years. Depending on your exact destination, you can face more or less rain, the average amount of rain observed during March in India is 26 mm and you can have between 0 and 7 rainy days. If you want to avoid rain, your preferred destination could be Bombay. Note that the gap in temperature between the different areas in the country is very high and the number of rainy days should be the same across the country, therefore you should pick your destination carefully if you decide to go in India in March. 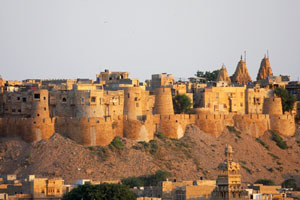 Based on weather conditions, our advice for one of the best destinations in India during March is Jaisalmer. Click on the name of a city to read more details about it, have more climate data history and see weather forecasts. It is not easy to describe the climate of such a vast country: However, it can be mainly divided into three different seasons, a hot season, a wet season and a cold season. The hot weather is mainly between February and May in the north and during these months the heat gradually rises to reach the top of the mountains in May. Temperatures can exceed 45°C in the Centre. In late May, the monsoon begins with heavy cloudbursts, thunderstorms and storms becoming gradually stronger from the south to the north, then it extends to the entire territory, ending in October, except on the southeast coast where it is the worst between October and December. Temperatures fall significantly in the north between October and January, while in the south they are constantly temperate. The best time to visit India therefore depends on the area, although the season from November to February is the best for the majority of them. If you want to visit the northeast, Kashmir or the mountains of Himachal Pradesh, it is advisable go between April and September. On the other hand, during the monsoon is quite a good time to visit the Rajasthan desert and the northwest of the Himalayas.